We’ve now been home two months, and now we’re heading off. I’ve been offered a job that is sending me to New Zealand for a week so we’ve decided to make a trip of it and we’re all going. One week of work in Auckland and then we’re getting a camper van and touring around NZ for 10 days. Being home has been hard. We knew it would be. The kids have settled into school now, we’ve moved into our house and we’re both working again (our empty piggy bank is oinking ‘thank you’). But have we been glad to be home? In many ways, yes. But for me, truthfully, I’ve really struggled with it. We’ve loved having our garden back, we’ve planted a lot of fruit & veg, and we can’t wait to start eating them. We’ve been harvesting our grapes and peaches and eating them with relish. The kids have been making the best use of our spacious backyard, something they missed in the European cities. They can often be found out there playing soccer, or just walking around looking at insects or plants. One of the most exciting things about returning was to catch up with all the amazing people we love. This has been much harder than we expected. Everyone’s lives are so busy (including our own), and finding time to catch up is not easy. This has been a stark reminder of everything we were trying to escape in the first place, that we’re so busy filling up our lives with work, school, extra curricular activities, that it’s hard to make time to spend quality time with the people in our lives. We spent so much of the last year in Spain, where a day (even a work day) is organised around coffee or lunch with friends, or a stroll with family. Real connection between people remains a high priority and people listen with their full attention. Nobody seems to be thinking of where they need to be next or their long list of tasks to complete by the end of the day. This sounds like a harsh judgement of Australia, but it is intended more as a compliment to the Spaniards, who, even in this busy, digital age, have maintained this incredible sense of interpersonal connection by valuing it as a vital part of the fabric of their lives. This is not affecting the kids so much – I believe kids are better at connecting with one another than adults – but I for one am grieving for the community and society we felt so strongly in Spain, even as unknown travellers. We’ve made a conscious effort to not fall into old routines, and that has been refreshing. We’ve made time to enjoy our family time together at the end of every day, although we’re all missing each other a lot. After 24 hours a day together for a year, I feel like a part of me is missing when the kids are at school or I am at work. Heading off again is exciting, and I’m so grateful that we’ve been able to do it again so soon (thank you to a very well-timed work offer). Our bank account is bottoming out – our financial advisor told us the other day that he’ll have to start guilting us out of this travel-bug soon or we’ll end up unable to support ourselves in the long run. He added that we need to be careful that we have enough money to do the things in retirement that we’ve waited our whole lives to do. At least we don’t have to worry about that part – we’re not waiting, we’re doing those things now! But his warnings need to be taken seriously, we don’t have anything to fall back on, and we need to earn some money instead of constantly travelling to afford to live, but when the opportunities come up, we feel we have to take them if we can. We know that our wanderlust will have to be reined in as the kids’ education becomes the priority, but for now, we’ll take the ebb & flow of life and squeeze every bit of juice out of life that we can. Checking into my flight this morning without Cass and the kids felt strange and unusual. Thankfully they’re only a day behind me and I’ll see them tomorrow in Auckland. I’m looking forward to reconnecting with that life I’ve been pining for since we came back home. Spending time with each other, being curious about the world, meeting new people and experiencing everything we can about this planet is much more precious to us right now than the minutiae of life. So that’s why after such a short time after coming home, we’re leaving again (even though we probably shouldn’t). So rather than rant to each other about how we could be the best Airbnb host, we thought we’d share our experiences in the hopes that some hosts out there might read it and take note. We use filters like they’re going out of fashion. If you don’t have wi-fi, we won’t find you. If you are out of our price range, we won’t find you. If you want more people to find your property, make sure you have listed all the facilities you have. And the more facilities you have, the more people will find you. Wi-fi is a non-negotiable for us as we work while travelling. Please also make sure it is usable. In some cases we’ve found it actually comes from a restaurant across the road, or it needs resetting every ten minutes. This does not count as having wi-fi. Some people believe that offering ‘Instant book’ is going to get more travellers applying. We don’t care either way if you offer it or not. What we do care about is that you accept/deny our booking within 24 hours so we have plenty of time to find an alternative. We’ve been left waiting over an hour by a host. We’ve had a host give us the wrong key and then it broke when it didn’t turn and he hit it with a brick. (Actually they were both the same host). We were then locked out (with our luggage locked in) for two hours on a Sunday night while we waited for a locksmith. The moral of the story is, check in should be relatively easy. We’ve had self-check in with automated doors, where you push a button on the message you received from your host and combination locks where the key is inside a cubby hole. Whatever the method of handing over keys, the important thing is that the host is not late to meet the guests, two sets of keys is excellent, and please be available from the time listed on your Airbnb listing. We always aim to arrive at the listed check in time, so being available at that time is important. We’ve had some excellent relationships with our hosts. We love to chat to locals and the host is the best place to start. These conversations have led to us finding local treasures, we’ve been given local delicacies, garden produce, given discounts at a surf school and had some very rich conversations. We would never expect any of that, and it comes equally from our hosts being decent human beings, and us being interested in people’s lives. Some hosts do not behave like decent human beings and we’ve had a handful of unfortunate experiences. Thankfully this is the exception rather than the rule. We stayed at one place where the host stored the linen for his other properties. A staff member came in each morning to collect the linen. We felt like it invaded our privacy and we told our host that it did. Our host didn’t respond to our complaint. We choose our places very specifically based on amenities and facilities. If you don’t have something and you say you do, we will be disappointed and more likely to give you a poor review. We had one place where the lights and the roller shutter in the bedroom didn’t work, so there was no light in that room for the entire day or night. After contacting our host, nothing was done about it and we had missed the Airbnb refund deadline. If your guest wants something fixed, fix it. At one place, the washing machine flooded the laundry every time it was used. Our clothes came out bleached, and ruined half our wardrobe. We’ve experienced dishwashers, washing machines, coffee makers, lights and plenty more that haven’t worked. Check that all your appliances work before your guests arrive. Ironically, as I write this, the doorbell has just rung and we have something being delivered in our apartment. Our host has arrived with the delivery to let us know, but we would have liked a bit of warning. Ultimately we’ve mostly had wonderful hosts, but we are very picky about where we choose to stay. I’m sure hosts have just as much to say about travellers as we have to say about hosts. If you’ve had any experiences as a host or a guest, we’d love you to share them in the comments section below. It was not without regret that we boarded our train this morning and left Burgos. The ancient capital of the kingdom of Castille fairly oozes history – from being home to one of Spain’s most popular folk heroes, El Cid, to more recently having the dubious honour of being the capital for General Franco’s ultimately successful 20th century fascist rebellion. It’s a wonderful city and, for a variety of reasons, a fantastic place to visit with kids. We found the people of Burgos to be overwhelmingly friendly and welcoming, and lightheartedly tolerant of our bumbling attempts to communicate in their mother tongue (Castellano, better known outside of Spain as “Spanish”, originated in the lands of Castilla – Leon and La Mancha). Eating out in Burgos was a particularly pleasant experience, and there were plenty of things we could do with the kids that kept them engaged, enthusiastic and wanting to see, do and know more. Because of this positive experience, we thought we’d share some of our highlights from Burgos for those of you who might consider bringing your children to visit this wonderful city in the future. It might sound like I’m taking the easy option by mentioning museums, but there are a couple of truly exceptional ones in Burgos that more than justify their inclusion at the top of this list. The first one we visited was El Museo del Libro (The Museum of the Book). This small, unassuming institution, laid out over four levels just off the Plaza Mayor, ambitiously seeks to chart the entire history of writing and books – although I noted that there was little mention of anywhere east of Mesopotamia or west of the Iberian Peninsula. Following the story from Sumerian clay tablets through to the 21st Century and the Kindle, you’ll find a range of examples of how humanity has recorded its thoughts and the influence that books have had on the rise and reformation of western civilisation throughout history. The Museo uses a variety of multimedia and multilingual resources to inform and engage visitors of all ages. The Second museum we visited was a definite highlight – not just of our time in Burgos, but of our trip to Europe so far. El Museo de la Evolucíon Humana (The Museum of Human Evolution) is one of the best natural history museums that we have ever visited, anywhere. Using a range of innovative and highly engaging technologies and storytelling devices, the museum’s installations guide the visitor through the galleries and display spaces outlining the scientific disciplines and techniques used over the years to trace the evolution of the human species. We all loved it, but it was particularly engaging for the kids, who literally sprinted from one display to the next, impatient to find out more about this fascinating area of scientific investigation. The Museum was built to underpin the incredible archaeological work done at the nearby World Heritage Listed dig in the Atapuerca Mountains. This is one of the world’s most important sites, in terms of an archaeological record of ancient humans, and it has contributed significantly to our understanding of the evolution of ours and other closely related hominid species. But the museum covers much more than just this one site, with sections on Darwin, the role of fire and much much more to engage and fascinate visitors of all ages. No trip to Burgos is complete without a visit to this museum. Full. Stop. Hint: we arrived at 6.45pm and discovered that entry was free after 7pm. Because the museum closes at 8, this only left us an hour to explore the entire institution, which was nowhere near enough time. If you’re thinking of taking advantage of this little work-around, we’d advise you to plan to come to the museum on two, or even better, three consecutive days, so you can take in everything that this incredible place has to offer. Children <8: free. Other benefits and concessions are available for a range of visitors – see website for more details. Acuarium – We discovered this awesome little bar quite by accident one evening while enjoying a paseo through the city centre. Located down a laneway just off the Plaza Mayor, Acuarium drew us in with its sign promising “Free Tapas”. The croquetas that came with our first round of drinks were pretty good, but a couple of minutes later a delivery of food to a neighbouring table really caught our attention. On enquiry, we discovered that they were having piparra en tempura, crispy tempura baby peppers, and we couldn’t resist ordering a plate for ourselves. The tapa was huge, and mouthwateringly delicious, but unfortunately it didn’t suit our kids’ frustratingly conventional tastes. Thankfully, the alitas de pollo (chicken wings), that came soon afterwards brought about a minor miracle, at least in our little circle – zero complaints, even effusive praise, for a meal ordered out in Spain! This might not sound like much, but we’ve had an incredibly frustrating time with food here in Spain – well, the food hasn’t been frustrating, it’s our children’s unwillingness to try new or “different” foods that’s been doing our heads in. But since Acuarium, we’ve found that they’re beginning to demonstrate a bit more enthusiasm for trying new things (even if chicken wings aren’t all that new). The service here was also really friendly and professional, and their willingness to tolerate our poorly framed questions about the food was greatly appreciated. Another of our memorable eating experiences was had at Viva la Pepa. Mem led us to this cool little bar//cafe, having found it on the vegetarian/vegan search portal Happy Cow. As a non-meat-eater most of the time, she’s been finding eating out in Spain particularly difficult, given this country’s strong focus on the cooking of flesh of every conceivable variety. We’ve found Happy Cow indispensable in finding places that offer a less meat-heavy menu, particularly in larger towns and cities. Viva la Pepa, which backs onto the Plaza outside the Catedral de Burgos, was one of these finds. Mem’s falafel burger was a winner, while they also satisfied my carnivorous inclinations with a meatier offering, and were able to keep the kids happy with their menu infantil and a pair of generous fruit smoothies. If we were to write a book about our current nomadic adventure (and we may well do just that at some point), it could quite justifiably be titled “A Guide to the Parks and Playgrounds of Europe”. If we were to do that, Burgos would warrant almost a whole chapter to itself. One activity we all thoroughly enjoyed was the walk up to El Castillo (the castle), which sits atop a knoll overlooking the old city. The ridge behind the Castillo is interlaced with a network of paths winding in and out of the pine forests and undergrowth, which proved a real adventure land for the kids. When we got there, the Castillo was unfortunately closed, despite opening hours which would seem to state otherwise. However, just nearby we discovered – wait for it – a playground, next to which was a bar that served cold beer and patatas bravas (amongst other things), so everyone’s needs were satisfied. Also great fun for these visiting Antipodeans was discovering the numerous storks’ nests – massive structures built on many of the city’s highest towers with no respect for history or eminence. Another highlight, from an outdoors perspective, was the Parque de la Isla, which we discovered by following the Camino de Santiago markers along the river, and which also had an “awesome” playground. Eating out and discovering new and interesting dishes is one of the most exciting and energising things about travelling. But sometimes, whether it’s because you want to save a few euros, or you can’t face another plate of fried whatevers, you just want to cook something for yourself and have complete control of what’s going into your body, and those of your family. Up until Burgos, we’d been pretty underwhelmed by the quality of produce available in Spain, particularly in the south. It was all just a bit tired looking and there wasn’t a great deal of variety. Paris, by comparison, was awash with beautiful fruit, vegetables and a thousand other high quality ingredients (the wine, the cheese, the… well, you get the point) – but that’s another story for another time. Thankfully, in Burgos we rented an Airbnb flat with a functional kitchen (and good knives – the owners also owned a restaurant) and we were able to find some excellent quality ingredients. This meant that Burgos now also carries the title of “Best Homecooked Meal by the Selwoods”. The benefits, for both your physical and mental wellbeing, gained from good quality, fresh vegetables should never be underestimated, and their availability definitely influenced how much we enjoyed our time in Burgos. No post on Burgos would be complete without a mention of the Camino de Santiago. This pilgrim trail, which winds its way from the French Pyrenees to Santiago de Compostela in the north-west of Spain, dominates Burgos, which is one of the major towns along the route. One gets the impression that the bulk of Burgos’ tourism trade is centred on catering for the needs of the tens of thousands of pilgrims who attempt the Camino every year, and it gives the town much more of a cosmopolitan, international feel than many of its counterparts in other regions of Spain. Shops are filled with paraphernalia, including walking sticks, clothing and other souvenirs marked with scallop shells (the symbol of Santiago – St James the Apostle), while restaurants and hostels advertise special rates for peregrinos (pilgrims). The camino itself splits into two as it passes through Burgos, and we had a great time looking out for the trail markers – tiles with the scallop shell insignia – that lead the pilgrim through town. Although we’ve only done very small sections so far, the Camino is high on our bucket list of things we want to do before leaving Spain. While you’re in Burgos, however, we recommend a day’s walk out and back along the Camino. You’ll soon find yourself out in the beautiful countryside that surrounds the city, sharing the route with people from every corner of the globe. There’s a real collegial feel to the Camino and you and the kids are bound to meet some interesting characters along the way. 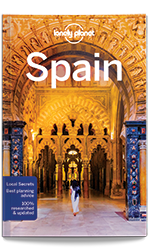 Check out the Wise Pilgrim Guides for some more really good information on the Camino and Burgos. So that’s just about all we have to say about Burgos. The city treated us incredibly well – we felt welcomed, entertained and well fed, and came away wanting to return to finish off some experiences and find time to check out a number of things we’d wanted to do, but just didn’t get time to this time around. Getting there: Burgos is 2.5 hours from Madrid and 3 hours from San Sebastian by train. If you book far enough in advance it’s a surprisingly cheap journey. Our favourite portal for booking trains in Spain is Trainline. Accommodation: We stayed in a terrific little family apartment sourced through Airbnb. Have you travelled to Burgos with your family? Have any other hints, tips or general comments on travelling with kids? Feel free to leave a comment below and let’s have a conversation. We have said so many goodbyes this week and each of them is unique. Some goodbyes are joyful, others are tearful. Some have a business like tone, ‘see you next time,’ with a handshake, but some are extended well wishes, hopes and thoughts. I’ve been thinking a lot about the people we are saying goodbye to, and how their lives may change, how the kids will grow in our absence, how they will pull through their trials, and how some of those battling illness will get by. I’ve been thinking about distance, and how it can be hard to be so far away when life takes a new turn. But distance also forces you to be more active in friendships and relationships. This I promise. As I say goodbye to family, friends, work colleagues, people who have influenced me, people who have supported me, people who have embraced me, I realise exactly how important each of these people are in my life. They are the true fabric of existence. The act of leaving has renewed my perspective and made me truly appreciate each and every one of them. There are some people I know I will never see again for various reasons and that is the hardest thing of all. But I know I’m lucky to have the chance to say goodbye. Saying goodbye is hard but these goodbyes have taught me that there is no perfect way to do it. No matter what you say, it never feels like enough. So to all those that we won’t see for a while, we love you. We’ll miss you. Most importantly, stay in touch, send us a message, write us an email, Skype us. Let us know how you’re doing. And we promise to do the same. 2017 is a big year for us. We are making some major changes to our lives, with the ultimate goal of creating the life we want to live. When we considered what life we want to live, it wasn’t one where we work to pay a mortgage, or where each day looked a lot like the last. We want to spend more time together as a family, and we want adventure, to experience new things, get acquainted with new people and understand ourselves in the world. So in 2017 we’re making changes to our work life, our kids’ education, our money situation and our relationship to stuff. That is why we’re packing up and heading Towards the Horizon. Why do we work? To earn money, to feel like we are contributing to society, for a sense of achievement? For the last few years we have been working to earn money, to pay for our mortgage, to pay the bills, and to work at something we enjoy. They are all good reasons to work, but I was working an average of 50-60 hours per week, and hardly seeing the kids. I enjoyed my job, but what I was putting in far exceeded what I was getting out of it. What relationship do I want to have with work, and what would my ideal day look like? I want more flexibility, with more control over when and where I work. We’ve both resigned from our jobs, and in 2017 we are taking the plunge to become digital nomads so we can achieve this goal, while also travelling the world. It’s a big step, but we’ve found a wealth of ways to make this happen. More to come on this in future posts. Our kids are at a really great, small country public school. We can’t fault it, however we want our kids to learn more than what the education system can provide. We want them to learn about other societies, other ways of looking at the world, other ways to be. We want to teach them that you don’t have to do what the world expects of you. Anyone can be bold. Travelling with two kids in 2017 will be challenging at times, but we are excited to share the kids’ education with them and teach them through the ‘school of life’. This item is not at the top of the list for a reason. Cass and I have never believed that money is a priority. It is a resource, not a goal. When we tell people we are doing this trip, people think we have a lot of money. We don’t. We have saved hard, but the biggest point is that we live simply. We don’t buy many things, we seek free or cheap experiences (which are often the best ones anyway), and we like spending time with good people. This way, we don’t spend much and we can save all our hard earned money to use as a resource with which to purchase some tickets overseas, visas, luggage and a few other things. We plan for our cost of living to be less or equal to what we spend in Adelaide. We will cut costs by not having a car, but we will be spending more on things like train tickets. We’ve done a budget and it should work out, as long as we keep living as simply as we currently do. In 2017, we will be earning a very small amount of money while on the road from some work we can do remotely, but most of all we will still cook most of our meals, eat locally, and not buy many things. This way, we hope to make our money stretch for as long as we can. Money isn’t about how much you have, but what relationship you have with it. I’m a true minimalist at heart. I have never liked owning a lot of stuff. For anyone who has kids, you will know that being a minimalist with kids is near impossible. Who knew that when they were born with nothing on their back, we would soon be inundated with a whole world of stuff? Travelling in 2017 means that we can sell and give away almost everything, and travel with only what we need to survive. This excites me. I won’t be at war with the toys left all around the house. I can enjoy my kids without having to make them pack up all the time. I can’t wait to see how this affects our lives. What this means for us in 2017 is that we can really live our lives in an honest, simple yet exciting way. We’ll explore this further in future posts, so stay tuned to find out more. In the meantime, leave a comment below telling us what bold choices you are making for 2017. I don’t know about you, but I’ve always had a thing about maps. They fascinate me. I’ve been hooked from the first time I ever opened an atlas as a youngster and saw all those lines and dots and names of exotic faraway places. It was an almost overwhelming introduction to a world of possibilities that fired my imagination and lit my desire to find out what was in those places with the strange, evocative names. My new favourite cafe, the Owl and the Elephant in Uraidla, South Australia, has earned this title because it is filled with tables upon which maps from across the world have been affixed. I call in there more than I should (we are saving money for an overseas adventure, after all) and paw over the tables, imagining myself on a ferry between Denmark and Norway, or once again standing atop the gorge bisecting Ronda in the midddle of the night, while a lone borracho wails plaintive flamenco tunes into the abyss. Perhaps it’s the unknown quantity that I find so compelling; the mysterious pull of the unfamiliar and a curiosity to find out what lies around the next corner, over the next ridge or beyond The Horizon. But there’s also a strong compulsion to use maps to gain greater insight into the familiar. I have spent hours plotting my movements across a high resolution map that charts the landscape of my childhood, topography that I know almost as well as the features of my own children’s faces. When I was younger, maps were objects of paper, the best of which expanded in a complex puzzle of folds to reveal their secrets. Early on I learned the value of deciphering this puzzle – the maps lasted longer and I avoided both the wrath of my parents and the scorn of my older brother, who was always a couple of steps ahead, cognitively. The legacy of these days can still be found at my house, where book shelves and car glove boxes are stuffed to capacity with dog-eared charts from past adventures and times from my youth spent dreaming of distant lands. These days, with the advent of the Internet, smart phones, apps and platforms like Google Earth, Open Street Map and Galileo, access to maps has never been easier, and you don’t need a Masters in Origami to get your geographic fix. Back in 2000 I spent three days walking one of the northern routes of the Camino de Santiago, el Camino Primitivo. I’m really keen to retrace at least part of that adventure, and to show my loved ones some of the places and sights that I remember with such clarity and fondness. Because el Camino goes well off-piste in some places, mobile reception will inevitably get a bit sketchy along the way, so to ensure we don’t get lost (well, not too lost, anyway), I’ve downloaded the Galileo app and a number of camino-specific maps. Galileo is “a map browsing app you can use offline. It makes life easier, when traveling (sic) without any Internet connection, because you can use previously saved offline maps on your mobile iOS device”. I’m no expert when it comes to technical details and anything I tell you would most likely be at best innacurate, and at worst completely misleading, you’re much better off visiting their site and getting the good oil straight from the source. But suffice to say, with the .gpx maps I’ve downloaded, I’ll be able to keep us on the path when we venture beyond the reach of modern mobile communications. And the sooner we do that, the better, as far as Mem and I are concerned. Because, really, this whole journey is in part about freeing ourselves from the routines and habits that bind us to our current conventional lives. And a big part of that will include disconnecting our online IV tubes. But when it comes to charting our adventures, we’re not going to be completely reliant on technology. In a burst of nostalgic inspiration, last week Mem and I visited our local map shop and bought the kids an old-school paper map each for Christmas. One was a world map, the other a chart of Spain. The idea is that this will both hone their origami skills, and also provide them with a fun way to keep track of our unfolding journey. In reality, they’ll probably either completely dismiss the idea, or embrace it for a couple of days then leave the maps folded shut in the bottom of their packs for the rest of the trip. But hey, it excited us and made us feel like we were doing something fun and “out of the box” to prepare them for the massive change that this adventure represents.